Ruby Dragon Katana With Wooden Scabbard | BUDK.com - Knives & Swords At The Lowest Prices! 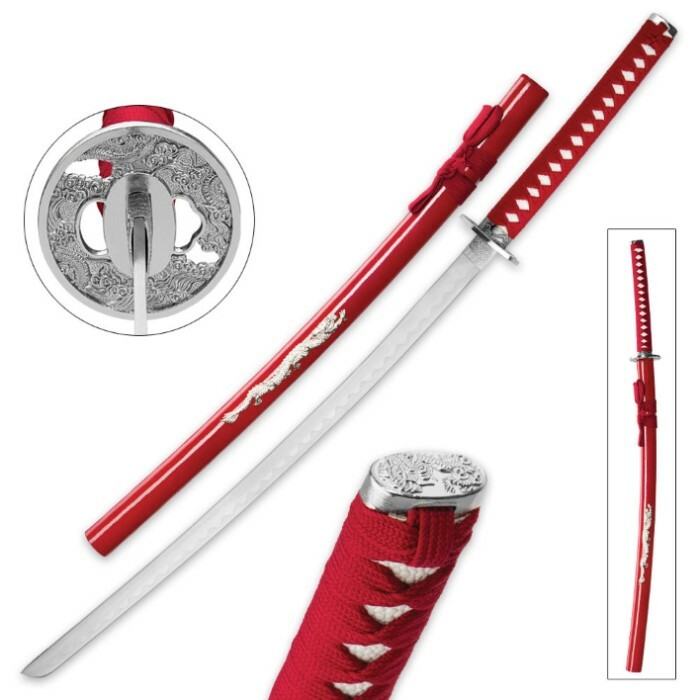 The Ruby Dragon Katana features the sleek lines, elegant appointments and stunning details of expensive custom samurai swords at an unbeatable, incredibly affordable price point! 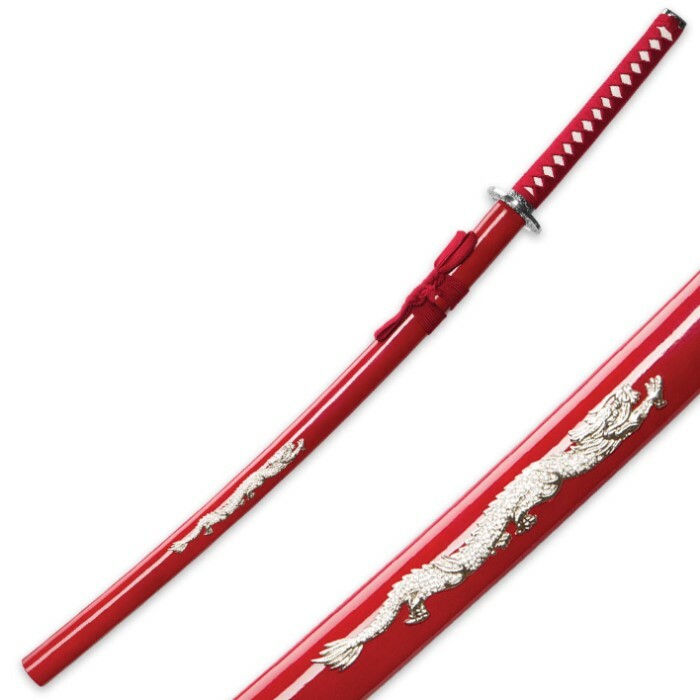 A standout in any Eastern weaponry collection, the "Ruby Dragon" boasts a shimmering 26 1/2" carbon steel blade accented with a gracefully oscillating hamon line. The blade retreats into a gleaming, silver-hued metal alloy guard and collar, both meticulously cast with swirling floral patterns and an iconic Eastern dragon in bold relief. Affording striking contrast to the polished ruby red scabbard, the dragon theme is furthered by an impressive 3-D flying dragon embellishment affixed gingerly to the center of the stately wooden sheath. The serpentine beast is studded with dozens of tiny transparent crystals, yielding a dazzling flash of light and prismatic color as it turns under illumination. Handsome wine red cord provides a charming finishing touch to the scabbard and pairs beautifully with the scarlet cord on the gently curved handle. This bold crimson-hued cotton handle cord causes the bright white synthetic ray skin around which it's tied to pop radiantly. It also beautifully offsets the silver-colored metal alloy pommel, which features a complementary 3-D dragon design. The Ruby Dragon Katana looks fantastic displayed on a wall, in a curio case, atop a mantle - practically anywhere. There's really no wrong place to showcase it! Best of all, the Ruby Dragon comes to you in all its beaming katana glory for a price that won't break the bank! Get two - one to keep and one to give away. It's a distinctive gift no one will soon forget!